Bessemer, AL It seems that every family has a restaurant where it convenes for special events and commemorations – the place where the family goes to celebrate graduations, birthdays, and anniversaries, and to gather after funerals and hospital visits and other more somber occasions. For my family, that restaurant in the Birmingham area is The Bright Star west of the city in Bessemer. The Bright Star, Alabama’s oldest restaurant, opened in 1907 and has been family-owned ever since. The Bright Star was awarded as an “America’s Classic” by the James Beard Foundation in 2010. Mine is a family of strong, vocal, and often divergent opinions on pretty much everything, including food. The Bright Star is one of the places that is in every family member’s “comfort zone.” In addition to being a safe choice, it also has a good and diverse menu with offerings for every taste. I always look forward to eating at The Bright Star, whether it is a quick lunch or a leisurely evening meal. Frank Stitt triggered Birmingham’s ascent on the national culinary map with the opening of Highlands Bar and Grill in the 1980s. But the culinary history of the Birmingham area is full of the stories of Greek families and immigrants who opened restaurants. Many of their descendants are still restaurateurs into the 21st century. The Bright Star is the anchor of that Greek-influenced dining tradition in Birmingham with off-shoots that range from fine dining establishments to fish markets, barbecue joints, and hot dog stands. The Bright Star was started by Tom Bonduris and has been continuously owned by Bonduris and Koikos family members ever since. Jimmy and Nick Koikos, sons of long-time owners Bill and Tasia Koikos, are the current faces of the restaurant, along with a large and long-serving support staff. Much of my recent planning with the restaurant has been coordinated through the invaluable and gracious help of Jimmy and Nick’s niece, Stacey Craig, and maître d’ Marlon Tanksley. The restaurant always bustles and the place is full of regulars as well as people who are traveling through or have made the effort to come to Bessemer just to check it out. The Bright Star has grown over the years in its current building in the middle of downtown Bessemer. The vibe of The Bright Star reminds some of New Orleans’ Galatoire’s. (It is a lesser known fact that the first Galatoire’s was in downtown Birmingham before Jean Galatoire ended up in New Orleans and opened his iconic Bourbon Street bistro.) The Bright Star menu that features seafood and steaks in the evenings serves a classic Southern “meat and three” lunch menu each day. The shredded cabbage with the signature slaw dressing is a staple, as is a superior bread pudding and an array of fine pies. The Bright Star serves one of my favorite gumbos. Tipping its hat to the New Orleans influences on the menu, The Bright Star does an annual “Taste of New Orleans” event in August that usually features the executive chef of New Orleans’ Commander’s Palace. Fresh seafood is delivered daily and Alabama Cattlemen’s Association has named Bright Star’s beef the best steak in Alabama. The large foyer entrance to the restaurant is full of memorabilia including awards, national magazine and newspaper articles, and archival photographs of the many celebrities and dignitaries who have enjoyed a meal at The Bright Star. One finds photos of Sandra Bullock and her father dining there among an array of celebrities and sports figures from earlier times. The main dining room is flanked with highly varnished pastoral murals painted by an itinerant German painter in 1915. A century of varnishing and cigarette smoke creates a warm glow from the murals and the combination of the murals and the high wooden booth backs creates an intimate and cozy feeling in the large room, even as the aisles are full of servers and patrons coming and going. Far in the back of the main dining room is the enclosed booth that was Alabama Coach Paul “Bear” Bryant’s favorite booth. For a recent birthday dinner, my mother reserved the Bryant booth and I dined there for the first time with a large portrait of “the Coach” looking down from the west wall. 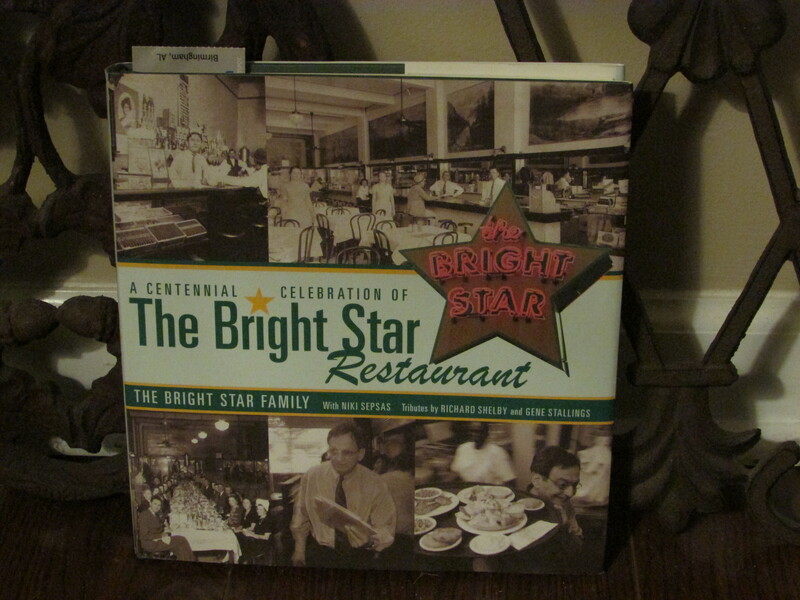 When The Bright Star turned 100 in 2007, a book, A Centennial Celebration of The Bright Star Restaurant, was released. The book, a project by nieces of Jim and Nick Koikos with assistance from Niki Sepsas, is a compilation of history, memories, recipes, and photographs of the restaurant. Bessemer, a vibrant industrial town in the early 20th Century, lost much of its industry in the 1970s and has suffered economic downturns and redefinition. Through it all The Bright Star has endured. I was in the restaurant this past weekend and am convinced that The Bright Star will be serving good meals to happy patrons for generations to come. 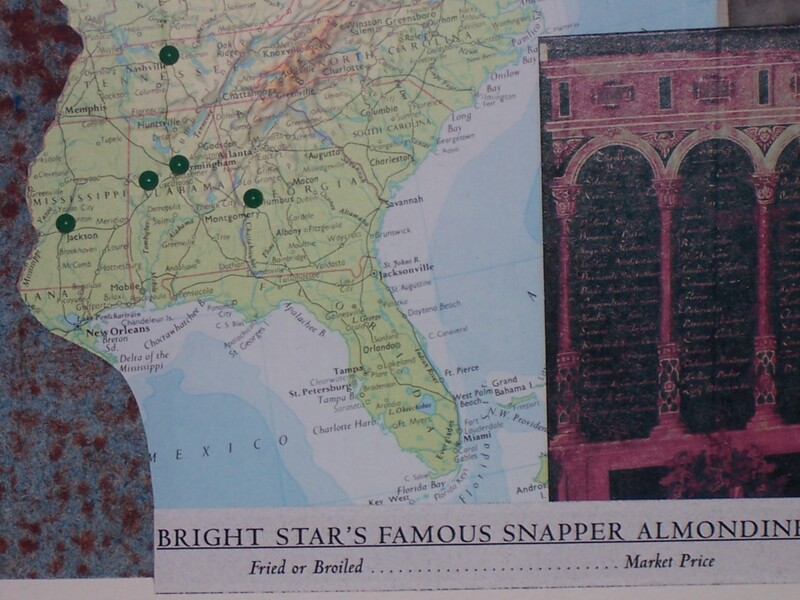 Note: The top image is a detail from Scott Smith’s assemblage, “Ensley” (2010), featuring the menu listing for The Bright Star’s “famous snapper almondine.” “Ensley” was a commission celebrating my parents’ marriage. Each pin represents a place they have lived during the marriage. Images of Ensley, the Birmingham neighborhood where they met, and other aspects of their marriage are represented, including images from The Bright Star menu. This entry was posted in Alabama, Bessemer, food, The Bright Star Restaurant and tagged Bessemer, food, Galatoire's, Greek restaurateurs in Birmingham, Jimmy and Nicky Koikos, The Bright Star Restaurant, the south on February 12, 2015 by gedwardjourney.